Why should you opt for dip powder manicures for your nails? To have noteworthy nails, one would normally need to go to a salon and have your nails done by a nail technician. Many find this time consuming and quite costly. To help themselves, they found ways to learn the trick and became expert at doing their nails in the process. If it means more bang for your bucks, more time to do other things than spending time waiting for your turn at a salon and being good even at designing nails. It can also be another source of income for you once you decide to turn your hobby into a business. Everything can be done effortlessly if you put your mind and heart to learning it. To accommodate even more nail fanatics, nail brands have added a plethora or formulations to their product line that even newbie users can easily make use of. Today, there are various products that you can use to create professional-looking nails. One of the most favored nail coatings used is the best nail dipping system and there are just so many reasons why. This dip powder system is available on retailer shelves. You can have one of the best-looking nails in no time. Doing nails is an art and requires some skill, but if you’re an insightful nail enthusiast willing to put in a little work, you can have the perfect powder-dipped nails in a breeze. You may have to pay more to have a dipping powder system, but the benefits that you’ll get will outweigh this. Dip powder manicured nails are strong, hence lasts longer. Regular nail polish would crack or chip even after just a few days of application. If you opt for gel nail polish, you will get nails that can last for more than a couple of weeks. But if you would rather have nails that can last for more than three weeks, go for a LDS dip powder manicure. The pigmented coating in powder form creates a harder cover for the nails, much like an armor. Even with that, you’ll not even feel the coating as hard and heavy, however. The finished nails are quite lightweight. As these products are made with essential nutrients that support nail growth, you will find your nails grow quicker and stronger. A dipping powder system is quite easy to apply. You will need only a couple of hours to have your nails done and wear them for weeks without fear that the coating with crack or chip. You will pick up the pace as you become more acquainted with the process. That means your nails will have more time to rest from filing, buffing and being touched by other products that you may need to use to create noteworthy manicure or pedicure. It doesn’t smell like nail polish. A dip powder does not contain liquid monomers, which makes it odorless. So, it’s not only gentle on your nose but it is also gentle on your nose. opting for a dip powder manicure will save you more bucks. Since you won’t need to have your nails done every few days, you won’t have to less for the product that you use. You can also do it at home and use every jar more than once to create beautiful nails any time you want. Two ounces of a jar of this dipping powder can last for about 50 manicures. That’s a lot of savings for you. 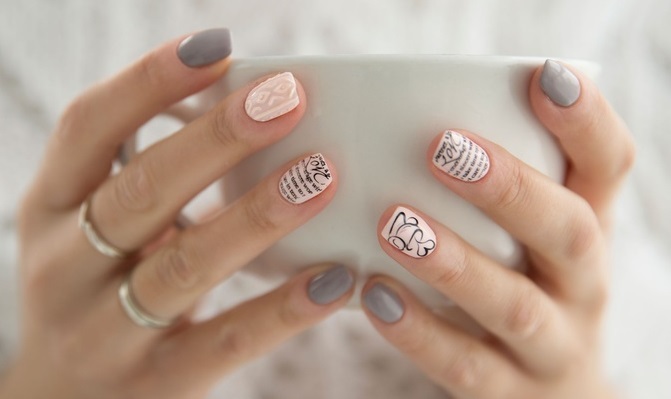 In case you are wondering how to make stunning nails with dip powder, you’ll learn more about the process as you read on. It’s really simple that even a complete newbie can do it. So, how do you create stunning nails with the dipping powder system? The process is easy. Like with any other nail polish system, you start with a freshly trimmed, shaped, buffed, and filed nails. Make sure that there are no hangnails or cuticles in the way, so you’ll have a great start with the dipping powder system. Once you have the surface of the nails ready, just apply a thin layer of the base coat on the nails, then dip the nails into the powder. You’ll need to tap the finger with the powder to remove any excess powder on it. You can do several coatings as desired. For a more solid look, you may want to repeat the process three times. To bond the color, you will need to apply the activator on the nails. Then, shape and buff the nails to create a perfect finish and then finalize it with a top coat. That’s it! You now have strong and beautiful nails you can flaunt for weeks to come. To maintain the shine of the polish, you may need to re-apply the top coat after a few days. Once you are ready to do a fresh mani, you will need to break the top coat seal and then thin the pigmented layer by soak off your nails carefully using acetone. Soak time will depend on the thickness of the layers as well as the quality of the product used. Never try to remove or peel off the polish from your nails as this will not only damage the nails but may also affect the nail bed. If there’s more product that clings on the nails after soaking, you may just have to buff them off with a fine-grit file and scrub with a cotton ball soaked in acetone any stubborn spots that refuse to go. If you are ready to give the dipping powder kit a go, you can find hundreds of stunning colors from brands like SNS Nails, OPI, Nugenesis, Kiara Sky, ANC, among others. Use the best dip-powder nail kits and essential accessories to start with your DIY dip powder manicures even at the comfort of your home. Once you perfect the process, you can even kick-start your own salon business. So, have fun, experiment, and find the designs that best suit your taste with a dipping powder system. How to keep your tan longer?